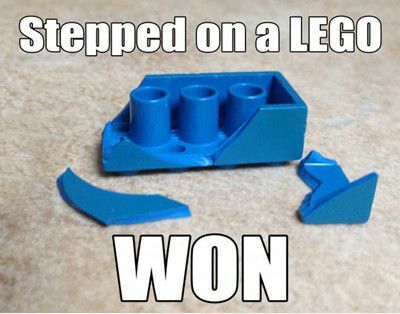 Every parent knows the tear-jerking pain of stepping on a LEGO with their bare feet. Kids leave them behind in the carpet and then they launch sneak attacks in the middle of the night when you are innocently walking down the hallway to go to the bathroom. Recently, LEGO formally acknowledged this universal parenting pain with the invention of LEGO slippers (pictured above). How are they different than regular slippers? Ummm… aaaah… I guess because they have the LEGO logo on them? Still the internet loves when a brand makes fun of itself. Especially when the brand has been the subject of a popular internet meme that has been around for years. I even launched Average Parent Problems with a LEGO post of my own. For lots more average parent problems, follow @averageparentproblemson Instagram! I disagree with the last I would think that would just be more painful because it has more sharp edges.